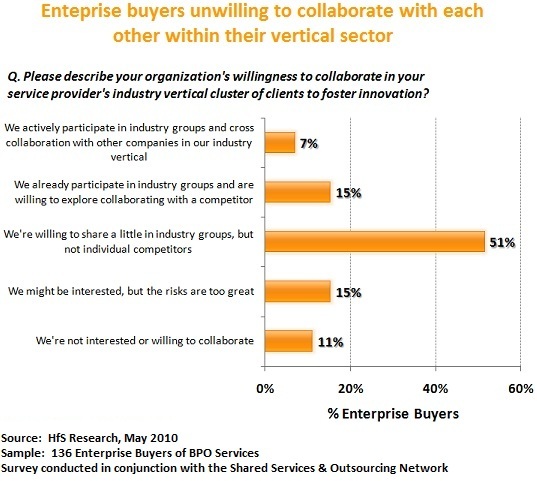 When we recently spoke with close to 600 shared services and outsourcing executives across both the buy and sell side of BPO, the tough news for much of the industry is that most enterprises are unwilling to collaborate with other firms in their industry to foster innovation with their outsourced business processes. I hear you gasp with shock and horror at this revelation. But why, then, do so many service providers still persist in stove-piping their business into vertical groupings, when their clients don't want to talk to each other about their business processes? While it's clear that clients like to be "sold to" by executives who clearly understand their business issues, once the engagement is "live", the vast majority of governance and process management issues are generic across all firms who outsource. To win more business, outsourcing service providers must innovate by creating and unleashing a multi-client collaborative model that isn’t restricting their clients to their industry vertical silos. Our distinguished analyst (I love that title, but he is very distinguished...) for shared services and outsourcing governance, Lee Coulter, investigates further. You can also read on this issue indepth in Lee's new report, available as a freemium pick on our research page for a limited time. I am almost afraid to write yet another article lamenting the lack of innovation in the BPO industry, but this time, I have some thoughts on how to change the game and I am spreading the blame around a little more evenly. There is plenty of blame to spread around on this one. It’s not entirely your BPO provider’s fault. Innovation is a delicate thing. It is really hard to coax into life, and remarkably easy to kill. That means it takes everyone doing the right things to create it, and anyone doing the wrong thing can stop it. I am constantly asked about innovation in shared services and BPO from enterprise clients. I have a special place in my heart for innovation because in today’s world, innovation often isn’t about getting ahead; it’s a case of running to stand still. Business consultant James Morse said it best, “The only sustainable competitive advantage comes from out-innovating the competition”. Sounds pretty easy, but there are a few nuances. First is, that both client and provider need to organize for innovation. Most people don’t have a clear idea of what that really means. It is the most foundational part of the equation, and the one that is often overlooked. I’ll come back to this in a moment. Contracting for innovation is not actually that difficult. It does mean however that both parties should be expecting to describe it in words, fund it with real money, and resource it with the right people. There is some weird amnesia that afflicts clients the moment they contract for BPO services. They forget that when they ran their own shop that they had specific people and budgets committed to projects and innovation. Somehow once a BPO provider is involved, there is supposed to be some miraculous automatic innovation machine that churns out valuable innovation without any effort or cost. Funding it is pretty straightforward, however it means everyone needs to clearly identify the funding for it and be clear about what benefits it should generate, and most importantly, don’t strip it out of the deal during price negotiations. It should be a separate part of the contract and pricing so that it doesn’t muddy the waters when evaluating the cost of service delivery. Governing it isn’t that hard as long as everyone realizes that the people that are dealing with crisis-of-the-day are not the right people to be managing innovation. Different people and different outcomes mean it should be governed separately. So really it comes down to organizing for it and this is where there is a fundamental breakdown, as our new research data emphasizes. By and large, BPO providers are organized around industry verticals. What is an industry vertical? Simply put, companies that aim to solve the same or similar problems in the marketplace. These companies are typically competitive, due to the overlapping focuses of the products and services that are provided to their customers. Hmmm, let’s put six or eight or ten competitors in a group together, and then tell each of them that because they are all customers of the same provider, that they will enjoy rich benefits of innovation. I am not sure that strategy was thought all the way through. Not gonna happen; for a whole lot of reasons. Most notably because each of the clients in an industry vertical group would really like to find a way to smash their competitors in the marketplace! About the last thing they are really excited to do is go share their best practices with a competitor! There is a better way… introducing a new model I call the Ecosystem of Collaborating Industries and Processes (ECIP) is based on organizing clients in non-competitive groups that share similar business practices along with clients that are affiliated by process. By combining clients that operate businesses with similar processes in non-competitive spaces, the model accelerates the leverage of assets and creates new channels of cross collaboration while preserving, and in fact enhancing, the provider’s credibility in a given industry space. 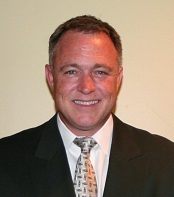 Lee Coulter (pictured here) is Research Fellow and Distinguished Analyst for HfS Research, having previously led global shared services for Kraft. Prior to that, he had senior roles with General Electric and AON - you can read his full bio here. a) The governance on innovation is the interesting change management issue. At the daily interaction the provider deals with buyer stakeholders that are paranoid about change - any change. In the absence of benchmarks for the "new, improved, process" the concern is that any change in the outsourced fragment leads to irreparable damage downstream that the supervisor does not want to take ownership for. The "innovation" discussion takes place at best in the quarterly review. Its hard to plan for the quarterly review when putting out daily operational fires, and no one now seems to own the balance between daily performance and the new world. Not having seen a single instance of this change having taking place, would be very interested in hearing of cases where this has been resolved. b) The capital markets world, in our part of the universe, has been replete with discussion on "utilities" and shared services. Its a good space for that discussion since securities trading really happens in an ecosystem that's been trying to gear itself up for STP. We've been part of buyer led discussions offering to get other ecosystem players involved if the providers can come up with a solution that addresses data security and confidentiality, but only for processes that have a high cost (or pain) element AND low differentiation. Am curious, does this not hold true anymore for this industry? .. Incidentally, we know of at least one instance where a firm we've worked with has actually created a supply chain ecosystem for technology manufacturers, distributors and retailers albeit in a single instance.. Interesting dichotomy isn’t it. Clients prefer providers who work with one of their competitors but at the same time want separate delivery structures. I haven’t heard of a single client review where they haven’t asked “so what are the best practices we can adopt from your other clients”. Ironic but true. At the same time, to ensure innovation/continuous improvement, service providers do make it a point to share best practices across their clients within a vertical and also across verticals, without getting into specifics of the client. Engagement forums are created and encouraged in progressive providers. Another thought: Innovation requires two things in my mind: a culture of putting the customer 1st and a deep understanding of end to end process. Innovation to me is all about delighting the customer, surpassing expectations and meeting a need that they did not even know they had yet. Without a full understanding of the end to end process it is hard to imagine or think about what is possible. I have recently been doing business process consulting and executive coaching. In addition my summer reading has included: Exceptional Service Exceptional Profit, Delivering Happiness, Unleashing Excellence and Customers for Life. What was reinforced for me was that the "people at the coal face" [folks actually doing the work] usually can see the things that are not working well. However, the issues the people see are not things that they personally can solve. The issues tend to be cross-boundary issues. The role of the executives and people managing the services should be to gather the innovation ideas from everyone in the organization and then assign project teams to implement them. Usually the best innovations come from working across boundaries and when groups are in silos their view will be much to narrow.